For the flourishment of business, communication is very essential. We can’t think of a company being successful or functioning smoothly without communication. Specialists of Tech Support Dubai have in-depth knowledge of technologies associated with business phones. Our highly qualified technicians will offer you the most suitable telephone equipment which will fulfill the needs of your organization. 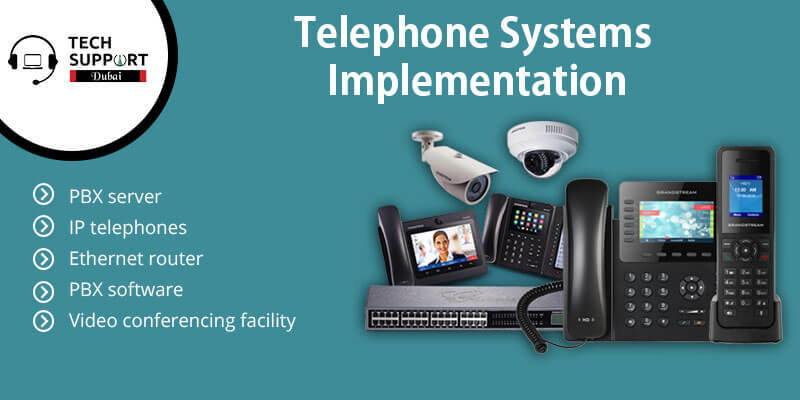 They will resolve all your concerns related to telephone systems implementation. Standard phone service for performing local as well as international voice calls. Installation of phone network includes the assembling of a PBX system, fax apparatuses, and phone. VoIP server installation also implies installation of IP gateways and proper software. Our technicians will perform all the onsite work related to the telephone that too promptly without creating any interruption in the whole working process and without causing any level of discomfort to the employees of the company. Our experts not only set up the telephone system but also thoroughly tests the connection and all hardware components and then trains your staff for the proper use of the equipment. Not for the sake of cost but also for the way in which you communicate and operate day to day telephone system is very essential. So, in this fast-moving world of advanced technology, to know which system is best for your business type to contact our tech support experts, they will help you and guide regarding Telephone Systems Implementation.